I introduced the Slabbed Nation to former CNN Whitehouse reporter Kathie Koch back in June after we renewed acquaintances as we gave her new book an advance plug along with her second CNN special on Bay-Waveland that we profiled back April 2008. The evaluation copy of the book arrived in late June and I could not put it down once I cracked it open as the 344 page narrative stirred my memories of those early post Katrina days, a time period that had a profound impact on countless lives from the disaster victims to those that came to help including my partner in blog Nowdy who was a first responder. There are certain events that still stir the emotions of the Slabbed and Kathie covered most of them in her book. Knowing how I reacted to reading certain passages I watched Mrs Sop as she began reading the book after I finished it. I knew immediately when she reached the story of the Clevelands and their fight for survival during the storm as her facial expression told the story. Nikki and her husband Patrick not only were separated from each other by the storm surge but were also separated from Nikki’s parents who did not make it. And yet despite the tragedy of Nikki losing her parents, and being hosed by Nationwide while her husband Patrick battled cancer, Kathie also conveys how the Clevelands’ story is one of hope in how they recovered from the storm even finding the strength to start a family of their own literally from the rubble. Similar themes run through the book from cover to cover as the events Kathie experienced are laid out in detail. As I read the passages about the early days after the storm which included officially sanctioned looting for food and how Waveland Mayor Tommy Longo carried on despite undergoing a knee replacement 2 days before the storm, my own recollections of that time would sweep over me. I suspect such is a common reaction for those who lived the experience. It was a time period when everyone stepped up for each other while ordinary people from across the country answered the call to come help. All involved were profoundly changed by the experience. I laughed as I identified the unidentified family with the American flag pictured on page 85 of the book. The shot was taken by Anderson Cooper’s crew just after the storm on Nicholson Avenue in Waveland and was used as part of the promo of the one year anniversary special CNN did on Katrina. There were actually 3 families, all part of one extended family, in that pickup truck. Despite losing their own homes to the storm these folks would find time to rebuild the home of an elderly Waveland resident gratis before starting their own rebuilding. People sometimes marvel at our tenacity here at Slabbed as we fight for our community. Folks like those pictured on page 85 and the fact they were far from alone in the display of such generosity after the storm is what makes this place special. Unfortunately the post Katrina grind also took its toll as Kathie herself slipped into despair made worse by the suicide of local builder Carl Heitzmann who murdered his wife before he turned the gun on himself in early 2006. The late winter and spring of 2006 was an especially tough time for most everyone on the coast myself included. Those tough times continued into 2007 when Waveland resident Wilford Asher snapped shooting up his neighborhood until he turned his gun on himself. No one escaped the mental toll extracted by Katrina though most muddled through somehow. Depression ceased to be a dirty secret as we all battled it in one way shape or form. 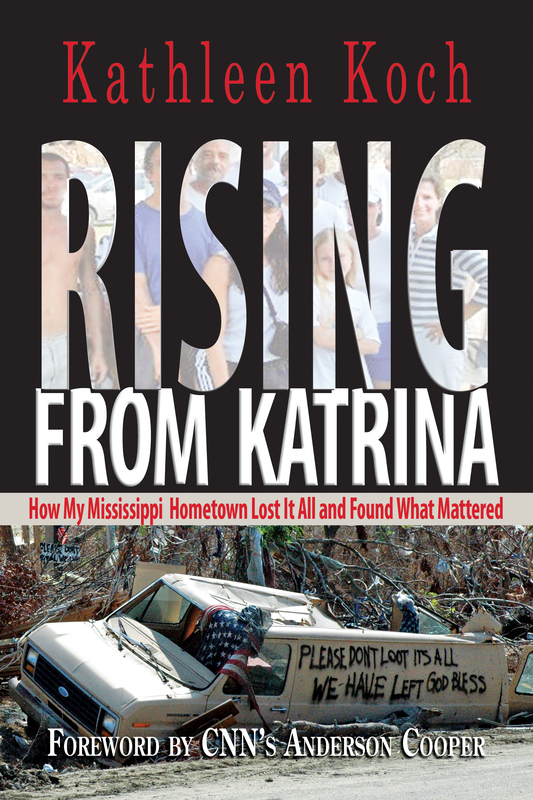 People love to read about themselves so Rising for Katrina will be a hit locally. After I finished the book it dawned on me it would make a great happy gift to give out to some of the people that helped Team Sop after the storm so I sent a few copies out as gifts. Russell had his handy in Dillsboro North Carolina a few weeks ago when our families met to spend a few days vacationing together. What happened here on the Mississippi coast after the storm will not be forgotten thanks to people like Kathie Koch, who along with Robin Roberts, Shepard Smith and Anderson Cooper, tirelessly reported from here in the storm’s aftermath. Kathie’s book, besides being a tribute to the people in her hometown, is also a testament to the fact that no one really leaves the Mississippi coast even when life’s road leads them elsewhere geographically. Rising from Katrina is available now online at Amazon and Barnes & Noble and will be available at your finer local bookstores in August. Kathie is also doing a signing tour next month and will be on the coast at the Gulfport Barnes and Noble on August 5th, the Garden District Book Shop on Prytania Street in New Orleans on August 6th coming back to Bay St Louis with 2 signings on August 7th at Bay Books and the Library. She will also be in Hattiesburg, Jackson, Oxford and several points in between the next week. I hope the Slabbed Nation joins me and turns out big for Kathie Koch when she joins us next month on the coast in advance of the 5th anniversary of the storm. Previous Previous post: Slabbed news miscellany: Another politician checks into the drunk tank. The Waveland Citizens Fund is shut down. The Sun Herald takes a crack at Simpsongate. Next Next post: As the sand berms turn part deux: Dear Thad, time to end the madness.